Needless to say – SPOILERS. Where to start? The intriguing plot strands slowly tying in together? The clunky bloody soap opera dialogue where everyone seems to have to emote at length to get there point across? That last panel that I figured was coming, but was still great to see? Where do I start? And that (imaginary) example would fit in one word balloon. Oh, and the other negative – Carl went home. He has a bandage around part of his head that suggests there is still most of his head there. I thought most of the right side of his head was gone. Keeping Carl alive, after what he went through, has been the first major misstep in this series, but we get a reminder of that error whenever Carl is on the page. I don’t even really acknowledge that he is there, I have no interest in his rehabilitation. He should have died, he really shouldn’t have survived. 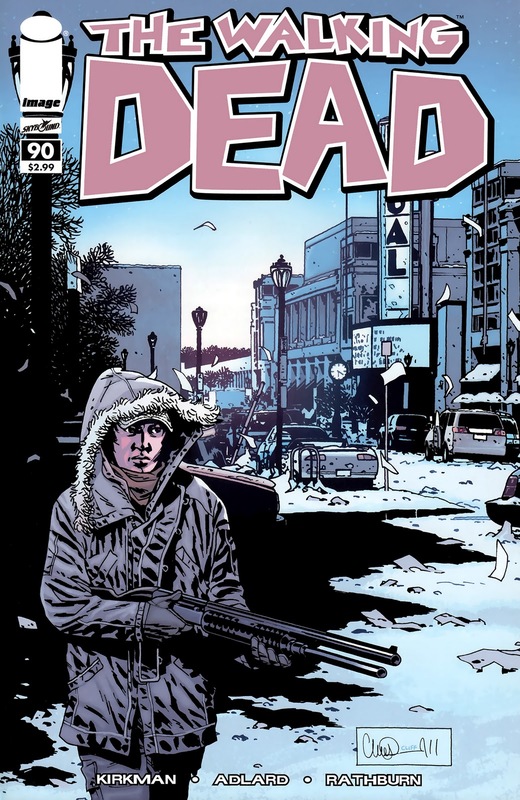 Or Kirkman shouldn’t have got Charlie Adlard to portray Carl with about a sixth of his head missing at the dramatic climax of issue #83, the penultimate issue of the ‘No Way Out’ arc. Anyway, onto better things. I love the way there are several plots (literally) beginning to formulate and/or fester. All is not well in the Community, even amongst those who Rick would count as trusted. It makes for intriguing reading, and that is a welcome return to form after several mundane issues. The standoff from last issue was resolved in a refreshing and slightly surprising way. I liked it. The kiss! That was great. A change of tempo. Another soap opera trope to round off issue #90! In summary, #90 got The Walking Dead back on its feet after one too many issues that have been treading water. Some events are being put in motion, and they look like they will converge (probably) in the lead up to issue 100. That should at least prove to be exciting – something that has been missing from this title for the last few months.